Look what just arrived on Friday. The UPS guy brought me finished paperbacks of THE WAKE UP. And you know me, right? When the publisher sends me author copies, I start giving them away. So let's do it. Another giveaway. And if you're reading this on Goodreads, please click through and leave your comment on my original blog. Otherwise I worry I'll forget you when the time comes to draw names. I'll leave this open for about a week before choosing three winners at random. Good luck! For those of you who are new subscribers, here's where we have fun. The UPS guy just brought me a small carton of these. 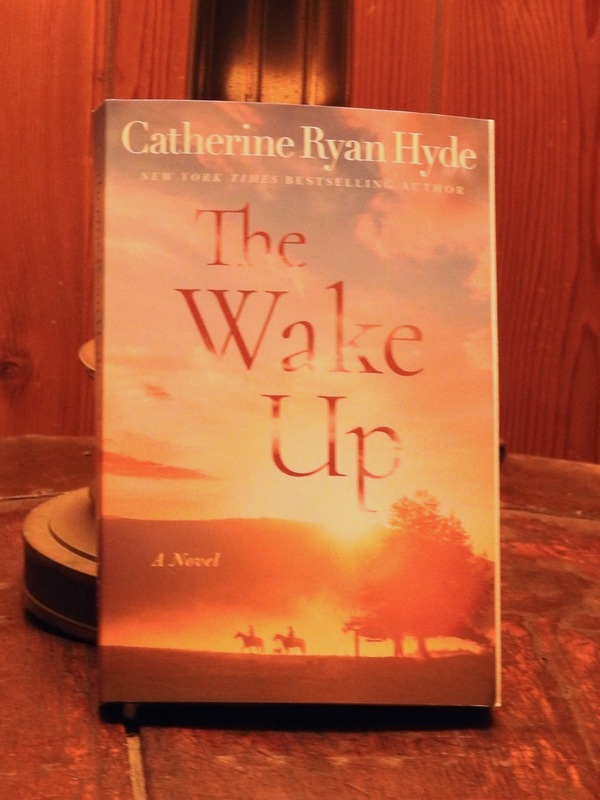 This is the MP3 audiobook of THE WAKE UP, my December 5th release. It can't be bought in stores--yet. I don't even have finished paperbacks. The audiobook beat them to my door. Those of you who know me know what comes next. I'm giving three away. I'll leave this open for about a week. Good luck! I'm not sure how many of my US readers know this, but my books are enjoying a great deal of popularity in Germany. Which means I owe a real debt of gratitude to my German readers, as well as readers around the world who are reading the German language translations of these titles. And now I have a way to show that gratitude! Two of my titles have recently been released as German language audiobooks. They are "Wohin wir gehören" (Where we Belong) and "Was wir suchen" (What We're Searching For, English title Leaving Blythe River). Amazon Crossing was kind enough to send me eight free download codes for each title. That's 16 free audiobooks! Here's where I give them away. If you read in German, or know someone who does, leave a comment below to let me know you're interested. When you hit "post" a field should come up for your email. Please enter your email so I can contact you with a free code if you win one. I promise I won't use your address for any other purpose. If fewer than 16 people leave comments, you'll each get a free audiobook. If this giveaway is more popular, I'll choose 16 winners at random. It occurs to me, as I receive my new and updated book plates, that many of my newer readers and subscribers might not know I even offer them. All you have to do is CLICK ON THIS LINK and follow directions. Basically you just send me a SASE and I send you bookplates. Hand-signed. Personalized if you like. And they cost you nothing but the two stamps. You stick one in your book... voila! Signed copy. I've offered these for a couple of years, but while reordering, I had them updated. The one with the book spines now has all the books, right through THE WAKE UP in December. The one with the two photos was updated from me in the Grand Canyon in '06 to me in my first horse show this past July. And look who got added to the footprint one. I'll expect a few SASEs in the post office box soon. Thanks for being my readers! SAY GOODBYE FOR NOW is free on Prime Reading! Just a quick note to let all my readers know that if you have Amazon Prime, the Kindle ebook edition of SAY GOODBYE FOR NOW is currently free. It's on Prime Reading. You don't need to have Kindle Unlimited, and it won't use up your one read of the month in Kindle Owners Lending Library. You just go get it and read it, and it's free! UK, German, and Australian readers: September is your month! I know it must be frustrating to my readers outside the US. I post these price promotions on the books, but not for your marketplace. I've been saying for months that my publisher is spreading out to more territories with these deals. September is a great example of what I mean. In the UK my newest novel, ALLIE AND BEA, and my second-newest, SAY GOODBYE FOR NOW, will be included in the "September 60 for £1," starting 9/1 and running through 9/30. As the title of the promotion suggests, the ebooks will be 1GBP each all month. For those of you in Australia, ALLIE AND BEA will be part of the "September 20 for $2" in the AU marketplace, starting 9/1 and running through 9/30. The ebook will be only 2AUD for the month. And last but not least, my German novel HEIMWEH (translation of WALK ME HOME) will be a "Top-Rated Deal" in the DE marketplace, starting 9/6 and running through 9/19. The Kindle ebook will be offered at 2.99EUR during that promotion period. A big handful of authors and I got together to offer a book giveaway that starts August 28th and goes until midnight EDT Tuesday, September 5th. Heather Burch will announce the winner on the 6th. You'll win multiple books by different authors if you win, so it should be a great chance to check out some new reading. My novel ALLIE AND BEA is one of the books that's up for grabs. Along with these nine signed books, the winner will receive a $100 Amazon gift card. You know, for... more books! Here's the link to enter. ***NOTE: LEAVING A COMMENT BELOW DOES NOT ENTER YOU*** as it would with my own blog giveaways. Because this is not solely mine. What a month for deal alerts! For my US readers, August is an incredible month to pick up one of my newer ebooks, if there are any you haven't read. There's a promotion called "Up to 80% off Kindle books in the US marketplace," and in August it features... wait for it... EIGHT of my newest books for only $1.99 each. The books on sale for $1.99 this month are: ALLIE AND BEA, ASK HIM WHY, TAKE ME WITH YOU, THE LANGUAGE OF HOOFBEATS, WHEN I FOUND YOU, WORTHY, WALK ME HOME, and LEAVING BLYTHE RIVER. All the way through the 31st! ARC giveaway! My favorite kind! Here's where it really gets good, in my opinion. If you subscribe to this blog, hopefully this is the kind of thing that makes you glad you did. Yesterday I came home from a day trip to find a small box of ARCs on my doorstep. This is The Wake Up. This is a book you can't buy until December 5th. So can you guess what comes next? Correct! I host a giveaway. I'll choose three winners at random next weekend (August 5th or 6th). Good luck! July starts a month-long promotion for my fairly recent release SAY GOODBYE FOR NOW. It came out last December, just before the newest, ALLIE AND BEA. Starting today it's being offered in Kindle at the promotional price of only $1.99. It's part of Amazon's Kindle Exclusive Popular Fiction Book Deal in the US marketplace, starting today and running through 7/31. If you haven't read this one, here's your chance to pick it up for a song. If you have, know that an author (me, for example) will love you forever if you share a book deal with your reader friends. Most of you probably know I'm currently releasing two books a year with Lake Union (Amazon Publishing). I've always written this fast, and let me tell you, it's great to have a publisher who can and will keep up with me. I think it's nice for readers, too. You finish ALLIE AND BEA. You look to see what's next. You have less than half a year to wait. I have here the final cover for THE WAKE UP, due to be released on December 5th, 2017. It's already available for preorder HERE. And the time will go faster than you think. I like this new cover, and I look forward to hearing what you think. If you're feeling impatient, click on over to the "My Books" page. I'm betting it will turn out there are a few you overlooked. Don't be afraid to try the Young Adult titles. Adults like them more than teens do--that's why I don't write Young Adult anymore. Seen the ALLIE AND BEA book trailer yet? I've shared this on social media, so if you follow me there you might have seen it already. But now that I have the video and can embed it, I want to share it with the readers who subscribe to this blog. After all, I promised to keep you up to date on all the news! Any German readers within the sound of my voice? I'm not sure how many of you know this, but my books have been well received in the German marketplace, with eight translated titles so far and several more in the works. 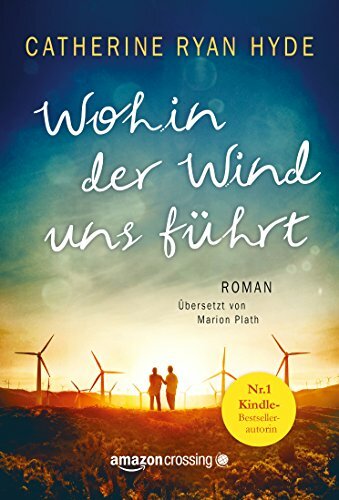 My newest German release is "Wohin der Wind uns führt" or "Where the Wind Takes Us," which is a translation of my 2008 novel "Chasing Windmills." My Amazon Crossing publisher was nice enough, just this morning, to give me free download codes for eight digital audiobooks of "Wohin der Wind uns führt" that I can give out in any way I see fit. So now the question: Are you one of my German readers? Do you know someone who reads in German? I sure would like to find good homes for all of these. Let me know in the comments below if you are interested, either for yourself or someone you know. I'll give these away on a first-come basis until they are gone. ***UPDATE*** So these have gone a whole lot faster than I imagined they would! I've already given away six of the eight codes on a first-come basis. I don't wan't them all to be gone when my subscriber's get their email of this post. So I am going to go on collecting names for a couple of days and then I will draw for the last two. Sound fair? Allie and Bea is here! I'm happy to say we are celebrating a book birthday today. Allie and Bea has come into the world and is available for purchase! If you preordered the ebook, look on your Kindle (or Kindle software). It's probably there. If you ordered a paperback you should receive it just about any minute now. If you haven't preordered and want to give this one a try, it's available right now in Kindle, Paperback, Audio CD or Audio MP3, or as an Audible.com download. For those who haven't discovered this already, my real, direct email address is on the "Contact Me" page, and I'll look forward to hearing what you think! For years my UK and Australian readers would read my posts about deal alerts, then leave sad comments that said something along the lines of, "Sigh. Not here." It was not something I controlled, and I felt awful. I could only hope that these readers knew I didn't love them any less. In the UK: Ask Him Why, Worthy, and Say Goodbye for Now are £1 all month. In the AU marketplace, Ask Him Why and Say Goodbye for Now are $2AUD all month. The title links will take you straight to the books' Kindle pages. If you've just subscribed to my blog, yes, this is an unusual number of posts in a short time. I usually only do two or three a month, if that. But it's an exciting time, bearing down on a new release next month, ALLIE AND BEA. And I'm mostly posting in an effort to give you free stuff. So at very least I hope I'll be forgiven, and at best I hope I've made you glad you subscribed. Up for grabs are three paperback copies of ALLIE AND BEA, hot off the presses this week. It can't be purchased until late May, so this is an early chance to grab one. As always I will ask you to read the text below, and many of you won't. All I can say is that you need this info to be sure you're entered. You can lead a horse to water, as they say. I'll leave this open for a week. Good luck! This is a little more personal and less strictly book-related. Hard to believe it was a year ago today that I got my first look at Mt Everest. I woke up in Namche Bazaar, and before breakfast my guide walked me up the hill to the Tenzing Norgay monument. He knew the clouds could close in later in the day, and that my view of the world's highest peak was not guaranteed. After breakfast we hiked up to the Hotel Everest View, where I spent the next two nights. On the way down through Namche I bought two packs of prayer flags, large and small, as gifts for the people back home. But a year has gone by and I still have three large and three small strings of them, still carefully rolled and never used or given out. I'm wondering if any of my readers would be interested in genuine Nepali prayer flags, lovingly carried down the mountain from Namche Bazaar to Lukla ("the world's most dangerous airport") by an author whose work they enjoy. If that's you, let me know in the comments. Because these should be out in the world, unfurled. And if you missed all of this last year, the photos are HERE. Thanks for being my reader! It's been too long since I did a giveaway, and I'm ready to start doing more. Up for grabs this week are three ALLIE AND BEA audiobooks in MP3 format. The UPS guy just brought them a couple of days ago. That means in the weeks to come he'll be bringing more fun items--CD set audiobooks and finished paperbacks. So watch this space for more giveaways. ALLIE AND BEA doesn't even go on sale until May 23rd. So I'm giving away something you literally couldn't buy if you wanted to. April is an amazing month for Kindle deals on my books in the US marketplace. If you haven't read them all and are looking to fill up your Kindle (or other device), this is your month. First, I'm pleased to announce that from now through April 30th LEAVING BLYTHE RIVER is on sale for only $1.50 as part of Amazon's 150 Kindle ebooks for $1.50 each promotion. Then there's another April promotion called 50 Kindle Book Deals for $2 Each. And I have four books included in this promotion. Four! They are: WHEN I FOUND YOU, THE LANGUAGE OF HOOFBEATS, TAKE ME WITH YOU, and WALK ME HOME. So what can I say but... happy reading! I'm happy to announce that I have a new title on Prime Reading, meaning it's free to Amazon Prime members anytime in about the next three months (they rotate the free titles). It's ASK HIM WHY. I know people confuse Prime Reading with the reading subscription program Kindle Unlimited. But KU has a small monthly fee. Prime Reading is now part of what you automatically receive with your Prime membership. It's more like the Kindle Owners Lending Library, except the KOLL has a limit on the numbers of books you can borrow, and this does not. Okay, I probably just confused you further. If you have Prime, and have not read ASK HIM WHY, go get it. It's absolutely free to you.